I’ll be the first to admit: I am a Southern girl and love my native Tennessee, but dang, “Why there gotta be so many rednecks?” I really looked forward to a weekend of kayaking down the Buffalo River and mountain biking/swimming at Bryant Grove in Long Hunter State Park, but had no idea I would be surrounded by my mulleted brethren almost the entire time. I guess my first indication was when we pulled up to Bells Bridge, the put-in spot for kayakers and canoers on the Buffalo River, and noticed a handmade sign that stated, “Cold Beer Under Bridge” and pointed to a beer shack that indeed was under the bridge. It was only 9:30 and the shack was hoppin’ with underage kids trying to buy a cold can of Bud Light. 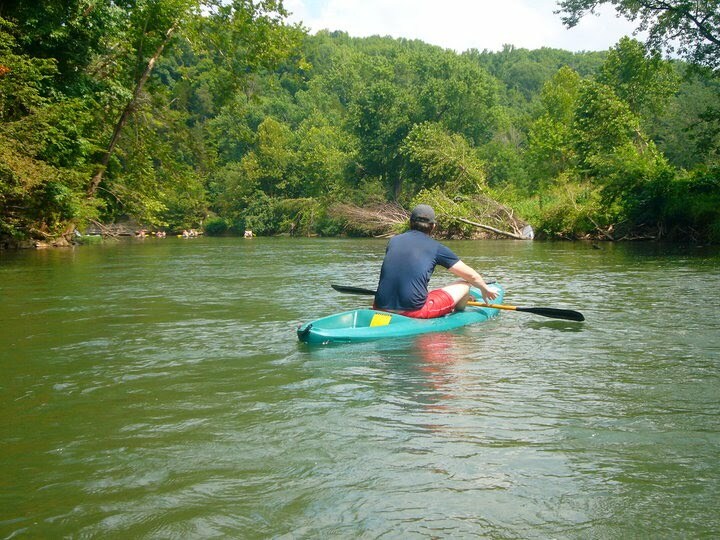 Brian and I determined it was too early to hit up the beer shack and promptly took off down the river in our kayaks, only to be surrounded by drunk/high teenagers in canoes and dudes with rebel flag doo-rags. The few times we were able to break away from the crowds and experience the soothing sounds of nature, were quickly interrupted with the distant yelling of the “F-word” by rowdy teens who apparently cherished the use of this particular curse word. We still managed to have a good time (and got in a grueling workout) despite the crowds and empty cans of beer that lined the river banks, but will undoubtedly never return. 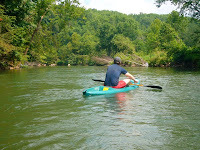 The 2-hour drive from Nashville just isn’t worth it when there are less crowded rivers like the Piney nearby. After the ride, Sarah and I decided to head over to the Bryant Grove swimming area to take a cooling dip in the lake. Mistake. First of all, the water was murky and not at all cooling- it felt more like tepid bath water. Second of all, we were surrounded by children in swim diapers (gag) and a young boy with a shaved head and rattail that put my long hair to shame. We promptly exited the swim area and returned to Sarah’s car where we passed a man with sagging pants and teardrop tattoos lugging his two kids toward the beach. It was time to go home.